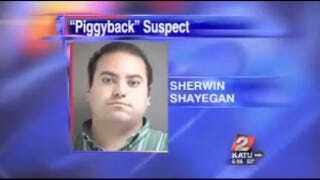 Sherwin Shayegan has been making headlines recently for his alleged habit of hanging around high schools in five different states so he can get piggyback rides from athletes. Now one of his high school classmates has written us to explain that his piggybacking penchant goes way back. I actually went to high school with this guy and he was pretty odd back then too. He was the waterboy for a couple of the sports teams at Inglemoor High School, and he was always very into his position. This may be some sort of fetishization of how it was back in the day. He was attracted to girls, I remember him going to school dances and trying to mack on the ladies there. He also did the piggyback thing to football players though, but everyone humored him. He does not have Down's, but is slow mentally. At IHS we had classes for special needs kids, but he never attended them that I know of. I did have a couple of classes with him over the years like home ec and gym. I was under the impression that his parents have money, that is why he is able to fund these jaunts all over the place. I recall him bring lots of cash to school and it getting stolen once. In gym he would do the piggyback ride thing when we were changing but he would be in his undies! He had quite a temper if he did not get his way. He was always getting called to the principals office for sexual type things towards both boys and girls. A Facebook page that appears to be Shayegan's indeed lists him as having gone to Inglemoor High School. I've contacted him for comment on the piggybacking allegations, but haven't yet received a reply. In the meantime, if his classmate's memories are accurate, it seems like Shayegan's history of inappropriate behavior is a long one. Previous accounts have insinuated that Shayegan pretends to be disabled in order to get what he wants. If that's true, he's apparently been doing this since high school. If it's not true, then maybe Shayegan has never really gotten the help or treatment that he needs.